More than a month has now passed since the EU and the United States first imposed sanctions on Russia in response to what they saw as its annexation of Crimea. On Monday, April 28, the U.S. hit Russia with a further round of sanctions. But what effect are the punitive measures having on the country’s economy and industry? More than a month has now passed since the EU and the United States first imposed sanctions on Russia in response to what they saw as its annexation of Crimea. On Monday, April 28, the U.S. hit Russia with a further round of sanctions. The punitive measures have been accompanied by the suspension of cooperation in the military sphere and the space sector. However, the main impact on the Russian economy has come from the financial sanctions and the deterioration of the investment climate; in particular, these have led to capital outflows. Official Western sanctions against Russia have affected a limited number of politicians and businessmen, believed to be part of Vladimir Putin’s inner circle. Among them are magnate brothers Arkady and Boris Rotenberg, former owner of the Gunvor Oil Trading Company Gennady Timchenko and billionaire Yuri Kovalchuk. As a result, Master Card and Visa International, without warning, blocked the access of Bank Rossiya’s cardholders to their networks. Following the imposition of sanctions, these entrepreneurs began focusing on their national interests in Russia. On the eve of the introduction of sanctions, Gennady Timchenko sold his 44 percent share in Gunvor to partners. In turn, Bank Rossiya and its subsidiaries completely abandoned foreign currency transactions. Against this background, some other banks also began to limit their foreign currency exchange activities. Thus, the largest bank in Russia, Sberbank, started refusing applications for the issuance of loans denominated in foreign currency. However, according to Mikhail Zadornov, president and chairman of the board of VTB24 Bank, foreign currency transactions are an integral part of the Russian financial system. “Russian citizens hold 21 percent of their deposits in foreign currencies, all payments for imports are carried out in foreign currencies, and there are currency transactions imputed by the economy,” said Zadornov. Sanctions against Russia have provoked a sharp outflow of capital from the country. By the end of 2014, according to the Ministry of Finance, this outflow will reach $70-80 billion. During the first quarter of 2014, the private sector has already taken $50.6 billion out from Russia, compared with $27.5 billion in the previous year. “For now, no serious sanctions have been applied against Russian companies, just against specific individuals. Therefore, there were no serious consequences. We can expect that the hardest hit will be the manufacturing sector, the military-industrial complex and the livestock industry,” said Vasily Yakimkin, assistant professor in the Department of Finance and Banking at the Russian Academy of National Economy and Public Administration. According to him, in response to sanctions, Russia has developed new regulations for the production of import-substituting products by the chemical industry at Russian enterprises in Yaroslavl and Kazan. 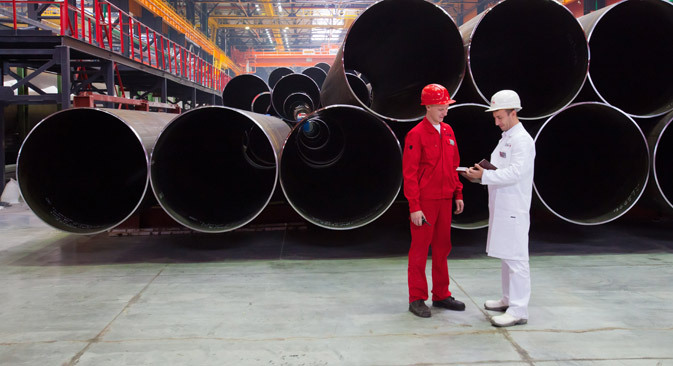 In its turn, the Chelyabinsk Tube Rolling Plant will launch production of large-diameter pipes, which Russian industry previously purchased from Germany and Ukraine. On the government side, a major consequence of sanctions has been the formation of a government initiative to establish an independent financial system. In particular, Russia is planning to launch a national payment system and its own ratings agency, including considering various options for cooperation with Chinese companies. According to Anton Soroko, analyst at the Finam Investment Holding, the most negative sanctions for the Russian economy that could be invoked by the U.S. and EU would be a reduction in trade cooperation. “On the other hand, I would not talk about the cessation of any negotiations between private companies,” said the expert. However, according to Vasily Yakimkin, if tougher sanctions are imposed, they may complicate dollar payments (if SWIFT encodings are canceled for Russian credit organizations), as almost the entire banking infrastructure in Russia is based on foreign servers and software. “The Russian military-industrial complex will feel the effect after two or three years. Already our troops are experiencing reductions in supply of weapons and accessories from France, Britain and Germany,” the expert warns. Representatives of the U.S. Treasury Department and the National Security Council have already announced, at a meeting in Washington with managers of mutual funds and hedge funds, about the preparations of new sanctions. And according to a statement by U.S. Permanent Representative to the UN Samantha Power, President Barack Obama is also considering sanctions against Russia in the banking, energy and mining sectors. In response, Russia sent the WTO a communiqué, accusing the U.S. of not fulfilling its trade obligations, and saying that Moscow may soon file a lawsuit. According to Russia, WTO commitments do not allow the U.S. to take any actions that could undermine the rights of Russian service providers. In their turn, Russian companies have already warned European partners that any additional sanctions would have a negative impact on their economies. In particular, the Russian company NLMK (which produces more than 17 million tons of steel annually) sent a letter to the European Commission, informing it of the devastating consequences for the steel industry in Europe that would ensue in the event of the introduction of EU sanctions against Russia. The letter cited the example of the 2,530 people that work in NLMK factories in Europe, and whose futures would be in doubt if new sanctions were imposed.